This condition is known as myopia, a term that comes from a Greek word meaning “closed eyes.” Myopia is not a disease, nor does it mean that you have “bad eyes.” It simply refers to a variation in the shape of your eyeball. The degree of variation determines whether or not you will need corrective eyewear. Myopia most often occurs because the eyeball is too long, rather than the normal, more rounded shape. Another less frequent cause of myopia is that the cornea, the eye’s clear outer window, is too curved. There is some evidence that nearsightedness may also be caused by too much close vision work. Our ability to “see” starts when light enters the eye through the cornea. The shape of the cornea, lens and eyeball help bend (refract) light rays in such a manner that light is focused into a point precisely on the retina. In contrast, if you are nearsighted, the light rays from a distant point are focused at a place in front of the retina. As the light will only be focused in that one place, by the time it reaches the retina it will have “defocused” again, forming a blurred image. Myopia usually occurs between the ages of 8 to 12 years. Since the eyes continue to grow during childhood, nearsightedness almost always occurs before the age of 20. Often the degree of myopia increases as the body grows rapidly, then levels off in adulthood. During the years of rapid growth, frequent changes in prescription eyewear may be needed to maintain clear vision. It is important to bear in mind that the frequent changes in prescription are not making the eyes “weaker”. During the growth period that occurs during the teen years the eye is also growing rapidly and hence the degree of blur is also increasing. As the growth cycle slows the prescription changes slow correspondingly. How is myopia diagnosed and treated? A comprehensive eye examination will detect myopia. Periodic examinations should follow after myopia has been discovered to determine whether the condition is changing, and whether a change in prescriptive eyewear is needed. Eye exams also help to ensure that vision impairments do not interfere with daily activities. Corrective concave (minus) lenses are prescribed to help focus light more precisely on the retina, where a clear image will be formed. Depending on the degree of myopia, glasses or contact lenses may be needed all of the time for clear vision. If the degree of impairment is slight, corrective lenses may be needed only for activities that require distance vision, such as driving, watching TV or in sports requiring fine vision. 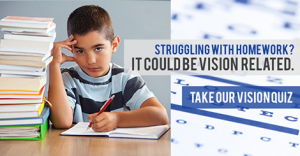 School age children may have vision problems ranging from mild to severe. When problems are suspected, it is important that the child have a comprehensive eye health examination to determine the nature of the problem and to rule out serious eye diseases. When vision conditions are treated properly, the child will enjoy the best possible sight. Avoid referring to the child’s eyes as “bad eyes;” instead tell the child that his or her eyes just bend light differently and corrective lenses are needed to help focus light rays. Ensure that they understand that nearsightedness rarely disappears and that wearing spectacles may be necessary in the long-term, but that this is not a disease. Use illustrations and simple explanations to help the child understand how a differently-shaped eyeball may result in his or her being nearsighted. Make the occasion of selecting new frames for lenses a fun time. Do not restrict the child’s activities because of poor vision. Include the child in discussions about his or her eyesight. Encourage the child to verbalize concerns about the adjustment to rapidly changing vision.